Budidesa is conceived by Budi Tek, a Chinese-Indonesian entrepreneur, philanthropist and collector, as a new home for his Yuz Foundation in his home country of Indonesia. The park is made up of a series of art gardens, exhibition spaces and a residence that together form a unique combination of contemporary art in a tropical environment. The site is located just north of Denpasar, the capital of Bali, and is characterized by its steep topography framed by rice fields at the top and a river at the bottom. The surrounding rice paddies are terraced in a typical Balinese way as it descends down to a heavily forested valley along the Ayun River bank. A walking path through the Art Gardens and exhibition spaces of Budidesa create an experience of art within nature. Marked by large-scale contemporary art from renown international artists such as Zhang Huan, Ai Weiwei, Anslem Keifer, Maurizio Cattelan, Adel Abdessemed, and Mona Hatoum, the quality and size of art within this tropical setting will create a global art attraction and a lasting contribution to Balinese culture. The indoor and outdoor exhibition spaces are designed to be seamless with the surrounding context. The inhabitable roof allows visitors to have a continuous stroll through the rice paddies and onto the museum’s display terraces. The museum is experienced as a landscape. 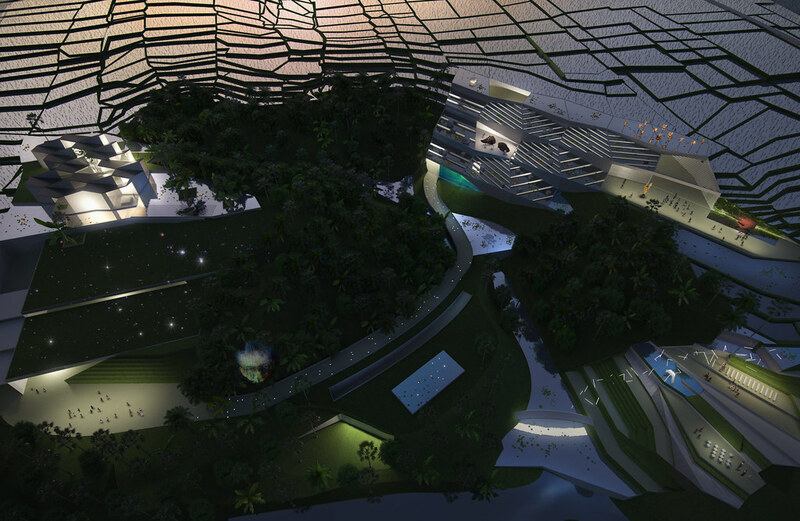 The roof creates a sculpture park on the outside and filters light into the interior through a series of skylights. At night, Budidesa comes alive with art through outdoor video, projections, reflections and illumination across the art gardens. Natural elements like plants, rocks and water are transformed by contemporary artists to experience the tropical outdoors of Bali in a new way.